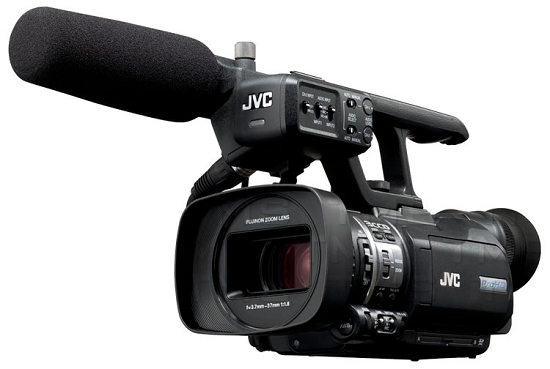 >> See other JVC items. 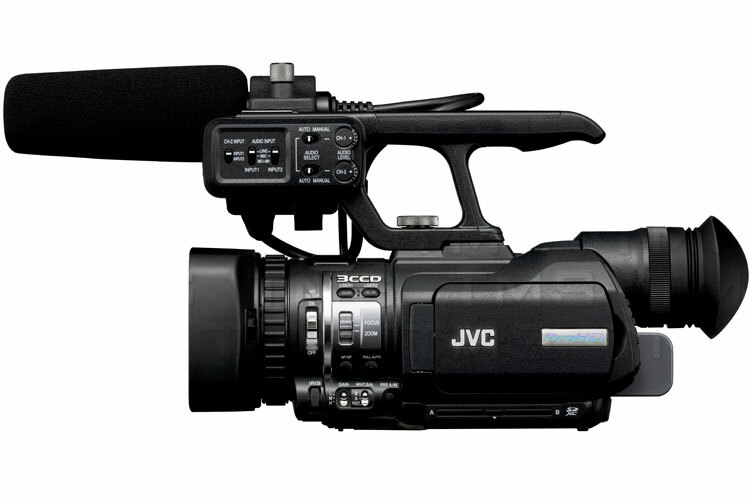 The GY-HM150U is JVC's latest and most advanced compact handheld camcorder. Based on the solid ergonomic design of the highly popular GY-HM100--currently in use by thousands of photojournalists at major television stations and networks around the world--we've upgraded the camera's features and performance without changing the attributes that made its predecessor so successful. A new encoder delivers not only improved HD recordings, but adds support for standard definition (SD). Manual controls are now more intuitive than ever with an iris dial next to the lens, and a total of 6 user assignable buttons. And shooters will love its dual card recording capability that creates an instant back-up copy! The GY-HM150 offers the world's fastest workflow delivering files that can be instantly edited in all professional level editing systems—all while producing recordings on par with broadcast cameras. 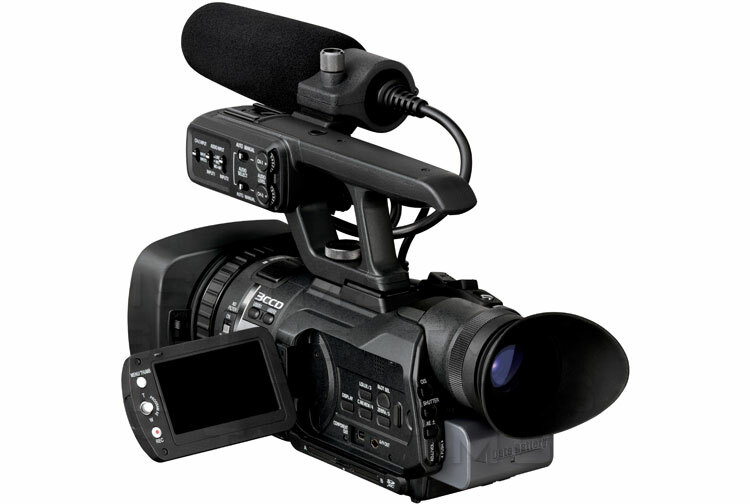 The GY-HM150 is highly recommended for demanding news and production assignments. Three 1/4-inch progressive scan CCDs—one each for red, green and blue—provide rich, accurate colors. To separate primary colors, JVC has incorporated a high accuracy Fujinon glass prism and the proprietary mounting technology. The Red and Blue pixel locations are shifted relative to Green, allowing the sampled luminance information to be significantly increased in both horizontal and vertical directions. This results in much higher resolution images without sacrificing sensitivity. Furthermore, using a global shutter, the design minimizes wobbling during quick pans and fixed pattern noise in low light conditions, contributing to a more stable image. The GY-HM150U utilizes a high definition lens by Fujinon, world leader in HD lens technology. This lens features 3 aspheric elements which minimize the weight and space required, while producing less distortion, ghosting, and flare. In addition, the lens surface is coated with a new Electronic Beam Coating (EBC) that greatly reduces degradation caused by light reflecting off the lens surfaces leading to greater light transmission and reduced flaring and ghosting. To protect the lens, a flip-in cover is provided, eliminating the need for an external cap. The focal length of the lens ranges from 3.7–37 mm (39–390 mm at 35 mm film equivalents), offering a good balance of wide angle and zoom. For wider angle shooting, the built-in lens hood can be removed and an optional wide-angle converter fitted. Focus is controlled manually or automatically. A smooth servo zoom is controlled with a conventional rocker on the handgrip, or manually on the lens. For close-up shooting, a macro mode allows for shooting subjects as little as 2-inches away from the lens. Exposure (iris) is automatically or manually controlled, letting the shooter adjust the depth of focus by selecting the appropriate F stop. The current F stop is displayed in the viewfinder in the manual mode. With the increased resolution and sharpness of HD pictures, even a small amount of camera shake becomes noticeable to the viewer. JVC's newly developed Rotary Optical Image Stabilizer (ROIS) corrects for lateral and vertical movement of the camera without the degradation of image quality associated with digital image stabilization systems. The result is pristine HD images that remain sharp and stable. At the heart of the GY-HM150U is a custom JVC-developed Dynamic Digital Signal Processor. Processing is performed on the full progressive 1920 x 1080 signal, regardless of the camcorder's settings, ensuring the highest picture quality in any shooting mode. All major HD resolutions are supported, including 1920 x 1080, 1440 x 1080 and 1280 x 720, as well as SD 720 x 480. Also integrated into the chip are five digital noise reduction technologies that evaluate the signal and apply the appropriate compensation while increasing vertical resolution by about 30%. 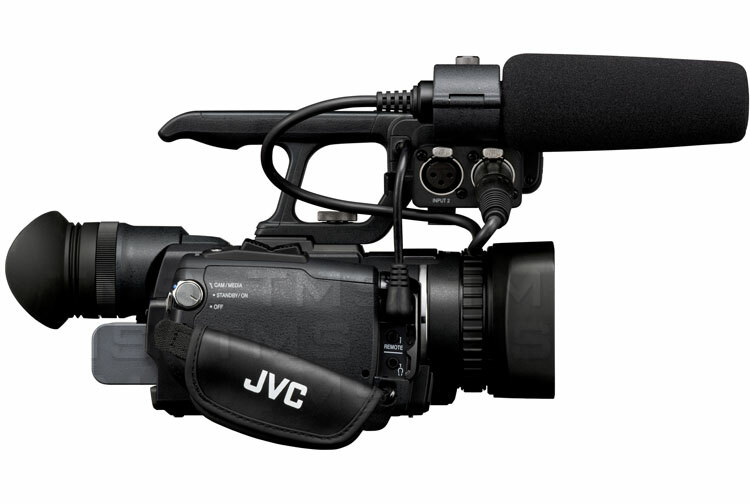 The GY-HM150U utilizes the encoder technology developed for JVC's renowned GY-HM790 series camcorders, used at major television stations. JVC's proprietary codec is capable of providing highly efficient compression up to 35 megabits per second, a bitrate that can support full 1920 x 1080 encoding. This is significantly higher than the data rates used in other hand held camcorders and results in recorded images of exceptional quality. MPEG2 long GOP is the most widely accepted broadcast standard compression supported by all popular editing systems and broadcast servers. Discontinued by manufacturer. See our current JVC line here.